Last week, I chaired the 12th Assessment Tomorrow Conference . It was great to see a packed house and to see that e-assessment has moved from being the preserve of a specialist few to something that everyone is now trying to mainstream. I think we filled a very small room at the first conference. 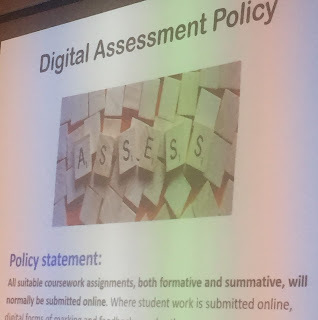 The slide above is from an excellent session from Prof Linda Creanor on the GCU approach to making digital assessment the default across the University. We still have a way to go to make digital assessment accessible to all. We have a real opportunity in Scotland , if we can get all of the sectors that support learning to work together to make some strong progress in this area. We still need to recognise that online assessment can take many forms and that it can be much more flexible than more traditional forms of assessment. In my opening I did some plugs for the Association of Learning Technology , Open Scotland and for new European standards for digital educators, significant in that they include a section on understanding digital assessment . The link to all of the presentations arrived today and prompted me to share some of my notes, as the chair, there were some excellent insights over a very engaging day. Here is quick summary of what we heard on day - it is my shorthand, so hope I am not short changing anyone . SQA has ambitious plans to move things on - but always concerned about access for all and the speed that the whole system can move at . This impacts the speed that SQA can move at. But good to hear that SQA is finally working with Skills Development Scotland around the vocational landscape. Think there is still a way to go in both speeding up and making things much more transparent here. It has to happen fast or the Scottish system will be overtaken by vocational reforms that are now well underway in the rest of the UK . I hope things can move faster on all fronts. I know it is not SQA but all the baggage - that is educational establishment - that really slows things down here. But I'll come back to going at the pace of the slowest. Working to make sure that changes in assessment, principally in schools space are evidence based. The government has lots of ambition and some clear policy drivers - the government challenge is often to get 32 local authorities to move forward together. In Scotland government set policy but it is interpreted and delivered by 32 local authorities. But tellingly this presentation was all about schools , school teachers. It is easy to forget how useful GLOW could be in delivering lots of things - there remains a real opportunity for SQA and Colleges to work in and around GLOW -but it needs some better partnership working. In my narrow view not using GLOW should not be an option for any local authority or any teacher . It needs SQA and Education Scotland to work together on things like models of self evaluation and quality systems - and they both need to use GLOW to engage teachers. That would make system work. There is a huge irony that Education Scotland still not making GLOW the main means of engaging teachers ? GLOW is good - go and have another look at it ! A super college presentation , putting North East College on my radar as a centre for innovative learning practice . 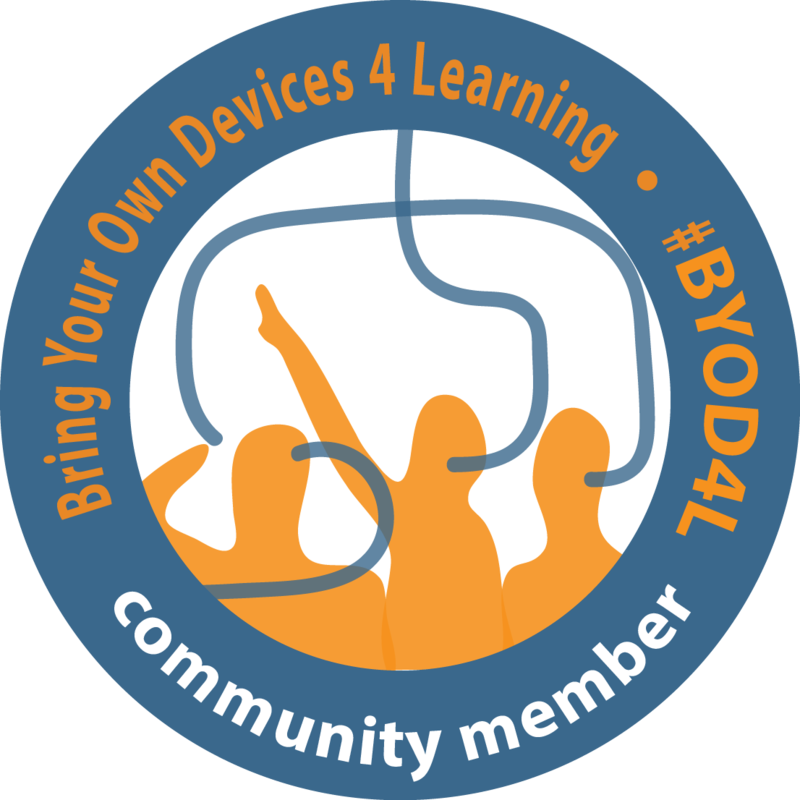 They have created a supported model for learners around BYOD and a clear model for staff development that supports learning into a digital learning future. I am going to get in touch with Robin as we progress CityLearning4.0 . This was the week Glasgow schools announced biggest European partnership with Apple to add a new dimension. Heading towards ipads for all in Glasgow. I love my ipad but see earlier postings I am not sure about this approach - I like laptops. I'm still looking for an authoritative link to Glasgow story. A good presentation on the use of SOLAR the current SQA online assessment system. Key message learners enjoy using on-line assessments and want more. I wonder how many centres are monitoring learner satisfaction and driving up the use of SOLAR . Learners want more online assessment - are your colleagues , your institutional policies and barrier to delivering this ? Scholar continues to provide a range of learning and support across broad range of subjects and is well embedded across the school system , complete with diagnostic and formative subject assessments . Now about to do all the training for the new national school literacy and numeracy tests, the Scottish National Standardised Assessments , to give them their full title . The local support commissioned from Scholar and Twig Learning. This should herald a new wave of understanding of models of e-assessment in primary and secondary schools. A useful plug for free membership of the UK E- Assessment Association - gosh was founding member more than 10 years ago with vision to get public and private partners to work together - still not seeing everyone pulling together. If you are interested in E-Assessment Membership is still free for ordinary members with institutional members picking up the running costs. standards. There is an irrefutable evidence base that it works . Actually I do understand but I still can't go public . A version of this should live inside GLOW to help teachers and learners understand standards. Maybe someone in Education Scotland will eventually pick up on this. A grand finale - SQA as an engine of change - absolutely - I know Colleges are ready for a lot of this. I think more than ready, champing at the bit , and looking around for new models and other suppliers. Colleges are now settling down and ready to drive on in this space. Know too from experience what SQA is wrestling with - but there is a real opportunity - if system can work together around the needs of the learner and the learner journey. Martyn has all the right ideas but needs joined up thinking from both within SQA and from all the stakeholders, if we are to see real change. We need much more visible partnerships between Education Scotland, Skills Development Scotland and the Scottish Funding Council - with learners rather than their self interest at centre. I just look at my own two school learners accessing a whole raft of excellent on-line learning and certificates and open badges from around the world - that is where Scottish education should be and not moving with the slowest . Our system should be moving with fastest and providing inclusive solutions for the institutions not ready for wholly on-line assessment and not waiting for them to be ready. Great too to meet some of my clients in private sector in audience, the event would have benefited from some more private supplier and or training provider input. To give us the full picture. The private sector is pushing on with online learning and digital assessment in all of its forms. Thanks to all at http://www.assessmenttomorrow.co/ and the brains behind it , Jeff and Martyn for a really excellent conference, it was a pleasure as ever, to chair.